1) something cotton, such as a T-shirt or pencil case. 4) an iron and a heat resistant surface. • Select your favourite design(s) and download the .PDF. This design is mirror imaged, but no need to worry about that. 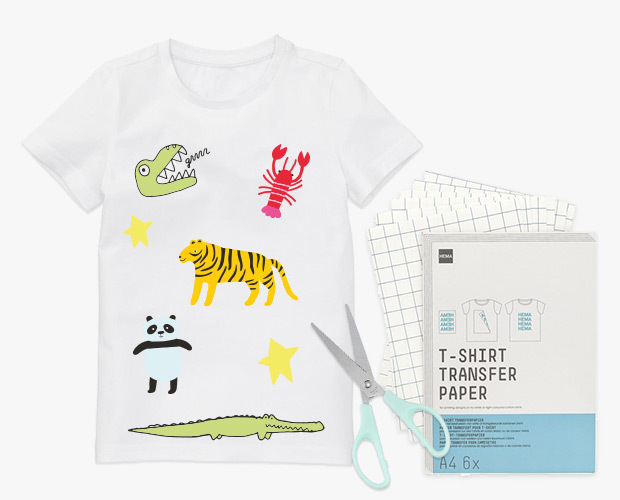 • Put the transfer paper in the printer and print your selected design(s). • Cut out the design(s) and put these on the cotton item upside down. • Put some baking paper on top it and start ironing the transfer paper. Follow the transfer paper instructions to get the best results. Please make sure that the item you have chosen to personalise does not contain polyester. This might melt while ironing.